We have a better way for you and your co-worker to spend your time at the office and you don't even have to get out of your chair. Office spacer is the first Gear VR game that offers a physical full-body experience--and it does so by leveraging your office. To fight back alien invaders, physically rotate your command chair into attack position at the push of a gamepad button. Feel the massive physical impact of the enemy drones crashing into your ship. Get the spins as impacting meteors spin your capsule out of control. The secret behind office spacer is your board computer Allie. Allie is not only good with machines, but also with people. This allows her to command not only the weapons of your ship, but also to get a hand from your co-worker, who she makes shake and spin your office chair just at the right moment. The result is virtual reality that is not so virtual after all. 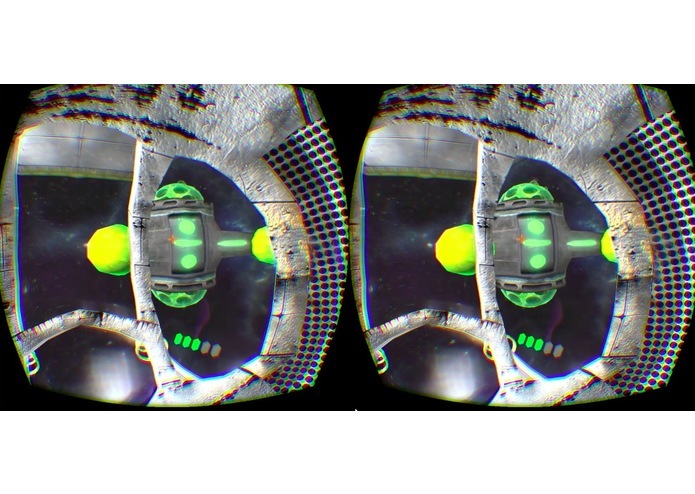 Office spacer is a two-person game running on a single Gear VR. Only the player sees the virtual world. However, by running the gear without audio headset, your co-worker can listen in on the game and in particular hear Allie's commands. Allie's carefully timed audio commands allow your co-worker to do the right thing at the tight time. Take turns--it's fun. Office spacer--putting your co-worker to work since 2015. 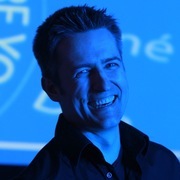 The key idea behind office spacer is to create a physically immersive experience for the player by making a second person perform the required physical work. Office spacer is a simple turret shooter game; the physical actions are rotation, physical impact, and spinning. 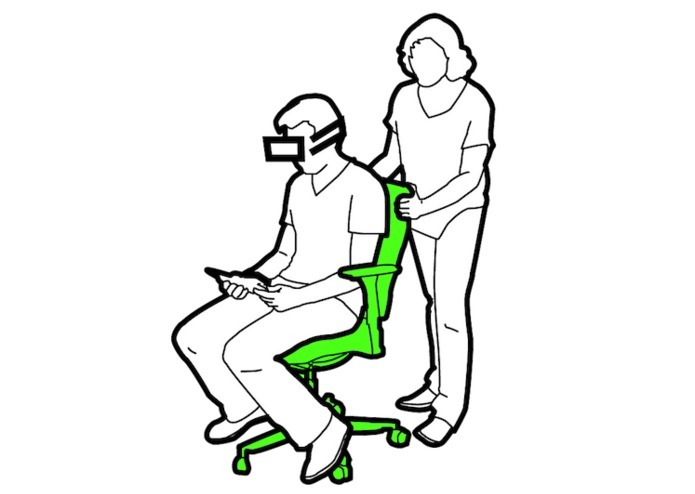 By physically seating the player on a swiveling office chair, we make it easy for the co-worker to perform these actions. We make the board computer Allie verbally repeat the player's gamepad commands and warn of imminent collisions. Since we run the gear without audio headset, the co-worker listens in on Allie's audio commands. All commands specify what to do and when to do it, allowing the co-worker to get action and timing right to provide the player with an immersive experience that goes beyond images and sound. FIRE: Look at an approaching enemy and press 2 on your gamepad to fire. ROTATE: Your weapons can only shoot at things you can see out of the front window. To fend off attackers approaching from a different angle, press left or right on your D-pad to rotate your capsule in 90 degree steps until you can see the respective attacker; then fire. At first glance, office spacer is a shooter game--one that is as cliche as could be: sit in a turret, shoot stuff and be shot at. It's fun, but ultimately not really what this is about. Our primary mechanic is the concept of increasing immersion by adding a physical experience that complements what players see and hear. 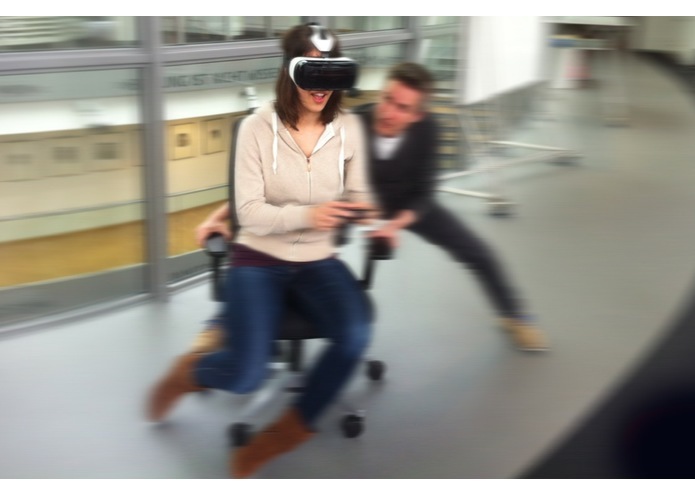 Going beyond the traditional rumble pack or vibration motor, office space offers motion that affects the player's entire body, in particular spinning and shaking the chair the player is sitting in. Ultimately, however, office spacer is about social interaction. By implementing all physical actuation by means of a human friend, office spacer implements a secondary mechanic that is orthogonal to the player's experience: the social experience of making a friend have a good time. Part of the innovation is in the concept of human-human actuation. We have been exploring this concept throughout the past year; however, we have never made an actual game, deployed an app, or created anything people could actually go download and experience. Office spacer is our first shot at turning our concept into an actual game and the first time we are publicly deploying. When we saw the announcement of the Oculus Jam, we did not quite see how our concept could be implemented on the gear VR platform, as our earlier concepts required a second screen for the player's friend at the very least. Once we understood the constraints, we realized that auditory feedback was the only way to pull it off. We tried a good number of approaches, such as passing the player's headset to the friend (at the expense of not offering any audio to the player) and splitting a headset between player and friend, but none of them led to a particularly satisfying experience. Eventually it became clear that the headset had to come off and luckily the Gear VR turned out to be surprisingly loud. Based on this, we developed the concept of "dual purpose" sound, i.e., we designed sound that would be plausible in the player's world (in the form of the talking board computer Allie), yet that contains all the information required by the friend to perform the physical actuation at the right time. The Milestone 4 questionnaire asks "What did you try that is new or unique in VR? For example, UI / user cues, multi-user interactions, visual/audio interactions, comfortable locomotion techniques, immersive control methods, or even extending the technology in some way." I guess office spacer is a tiny bit of all of these. PS. : To the organizers: We think of office spacer primarily as an interpersonal experience; we thus submitted it as an "experience". If you think office spacer would make a better fit for the games category, please feel free to move us to the games category. THE ISSUE WE ARE TACKLING: The gearVR feels fantastic and natural--until one picks up the game controller. Driving through virtual space using the controller causes us to see a virtual world moving, but we feel that we remain stationary. This disconnect between eyes and vestibular system makes the experience feel artificial and causes motion sickness. In our Jam contribution we will address this, by creating a physical experience that matches what we see in the virtual world. BACKGROUND: In the past months, we conducted a research project about a "motion platform based on people". The key idea was to replace the large and clunky motion platform with four friends that--following instructions by a computer system--whip a single player around in the air, filling in just the right motion cues at just at the right moment. Out set-up involved a good amount of hardware, was complex to set-up, and was exhausting to the four helpers. FOR THE JAM, we have started to create a brand new, previously unpublished mechanism. it builds on what we learned from our research project, but uses a different mechanic to create a different experience on just the right hardware for the jam. (1) As shown in the sketch, there will be a single "player" wearing a GearVR and carrying the GamePad. The player will sit on an office chair, i.e., a chair will rollers/casters. The player will be in a driving experience. (2) A single friend will be there to push and spin the player around, i.e, as players experiences driving around, taking curves and bumping into things in the virtual world, they experience the matching physical sensations just at the right moment, resulting in a single consistent experience that it very intense, but actually less prone to motion sickness. We are currently exploring (1) three different types of experiences, all in the realm of racing & bumper cars. (2) three different approaches of sending real-time instructions to the friend. When we hit the respective milestone we will converge on the best experience and approach and drop the other two. UPDATE for Milestone 2: We converged on the specific physical/haptic game mechanics and a setting: a simple 3D turret shooter game. The player is sitting in a turret, defending the mother ship from intruders. The mechanics: (1) players can aim using head rotation and fire using the gamepad, (2) Players can target things behind them by instructing the turret to rotate physically. (3) If they fail to shoot an approaching ship, they get physically hit/shaken. (4) If an attacking ship grazes the players turret, the turret (physically) spins. We are still debating dodging. All mechanics come with the matching protocol that lets the friend standing behind the player perform the right moves at the right moment. VISUALS: simple, player inside of cockpit, rotates inside the turret capsule, outside space and enemy ships, sky box. We are implementing software (Unity) and the physical interaction in parallel. UPDATE for Milestone 3: Shared video of main game mechanics working (looking around, shooting, and interacting with the human actuators). Tutorial sequence shows (1) players see how to set up the system (2) how to operate the controller (fire and rotate) and (3) the player's friend learns which sounds to respond to and how. Also showed in game footage of player located inside a capsule vaguely inspired by the bullet turrets from WWII, defending against projectiles coming at the turret. UPDATE Tuesday before Milestone 4: Shared better preview of tutorial sequence https://youtu.be/Clul4-wENZk and preview of in game experience https://youtu.be/KD84i6QGjGQ.